The High☆Speed! interviews continue with two conversations with artists commanding the animation department: character designer Futoshi Nishiya and prop designer Seiichi Akitake talk about how they project the character’s personality into the design work, be it general traits or daily life minutiae, while also sharing anecdotes regarding the production process. ―What was your mentality heading into the production for High☆Speed! The Movie? 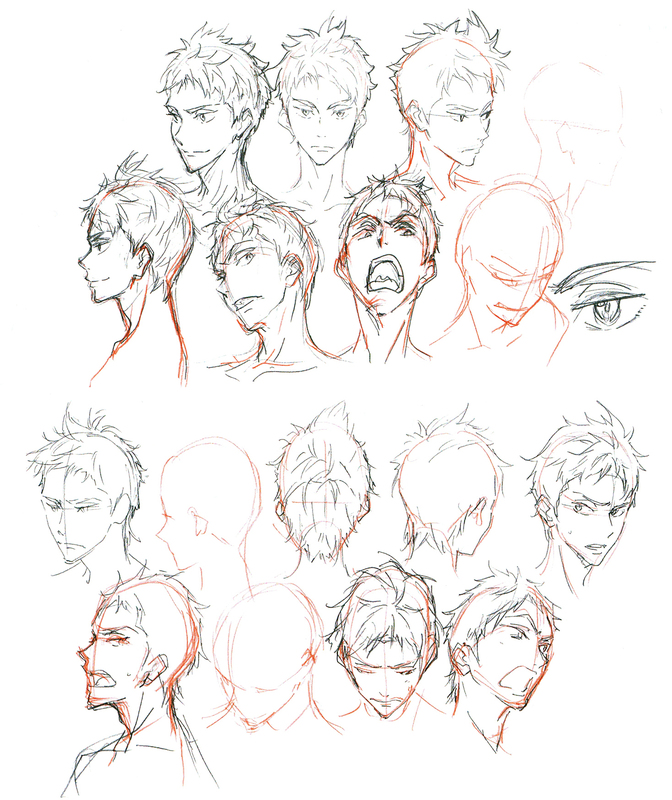 In the TV series my goal was to draw the high school swimmer boys and their tight bodies in a cool and charming way. This time we dealt with a story set in middle school, however, so I wanted the drawings to highlight that the characters still are mentally and physically developing. Something that’d feel like typical middle schoolers, appropriate for their age. ―The cast members told me that they found it difficult to voice middle schoolers; what did you think of drawing middle schoolers, Nishiya-san? As I‘d already drawn the high school and elementary school time in the TV series, I wanted to pin down the charm that’s characteristic for middle school – a time period which falls under neither of the above two categories – as a new challenge. Spanning both Free! and Free! ES, I‘d been drawing Haruka & co. for almost three years, so I felt responsible and was assured that I‘d be able to draw a new side of them without any problems. ―As the movie’s chief animation director, were you able to look over the whole project? What impressions did the production leave you? I got to check all cuts this time, it felt like everyone headed into it in high spirits. However, due to the movie’s volume and numerous swimming scenes it was quite of a struggle for us. 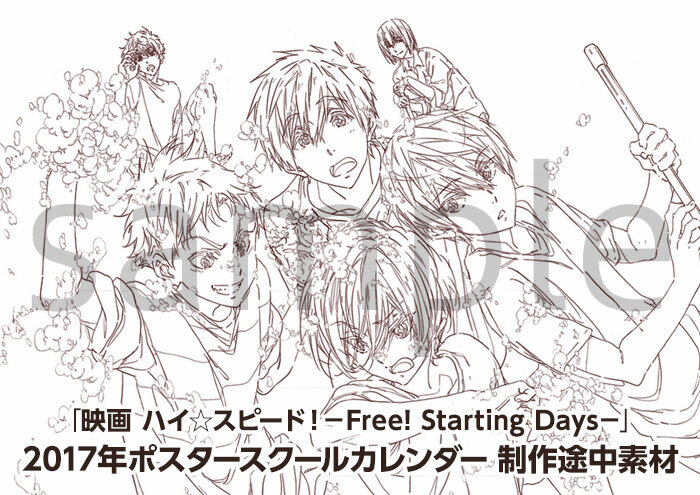 Since the Free! series are works that were influenced by the whole staff, we deepened our comprehension of the characters, so in that regard working on them was uncomplicated. There are new characters too, adding a fresh flavor to it, and we could make use of our past experiences. I got the impression that High☆Speed! The Movie was a long-awaited project among the whole staff. ―Is there a scene or cut you found memorable? The part that left the biggest impression on me is the reconciliation scene between Haruka and Makoto at the Iwatobi pool at night. The key animators and animation director in charge drew it with such great tenacity and delicacy – there‘s a passion to its art makes it slightly stand out compared to other scenes. Also, the swimming scene with Haruka in the opening, as well as the final swimming scene at the competition are impressive too. The depiction of water and swimming is simply stunning, so I was overwhelmed every time I watched those. ―The other staff members told me that the accumulated experience and skills from the TV series came to fruition, too. That’s right. The presentation of water in particular benefited from the photography staff’s experience. There were some parts that would have been quite troublesome to nail just with animation. Of course, we did our utmost with the hand-drawn work too but I believe that the art’s attractiveness increased considerably because of the photography process. The portrayal of water was truly beautiful. ―As a work that is viewed on a big screen, it seems like a plan to increase the visual density for the sets and backgrounds was devised. Was there anything you took into consideration from an animation point of view as well? Due to my personal habit the number of lines tends to be rather high, but I don’t think I consciously changed much compared to the TV series. Rather than the line art’s thickness in the sense of visual density, I asked myself how I should draw the characters’ silhouettes or bring out their best possible facial expressions, and aimed for a generally charming drawing. ―When you adapted the character designs from the illustrations in the light novel High☆Speed! 2 to High☆Speed! The Movie, were there any modifications? Back when I drew the light novel illustrations, I didn’t think this work would be turned into a movie, so I simply drew those under the assumption that they‘d serve as promotional material. However, no character’s design was considerably changed for the movie. 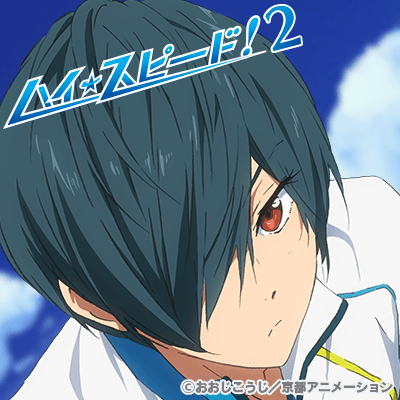 The Ikuya in the illustrations resembles Haruka a bit, therefore I adjusted his hairstyle by making it look more distinct. 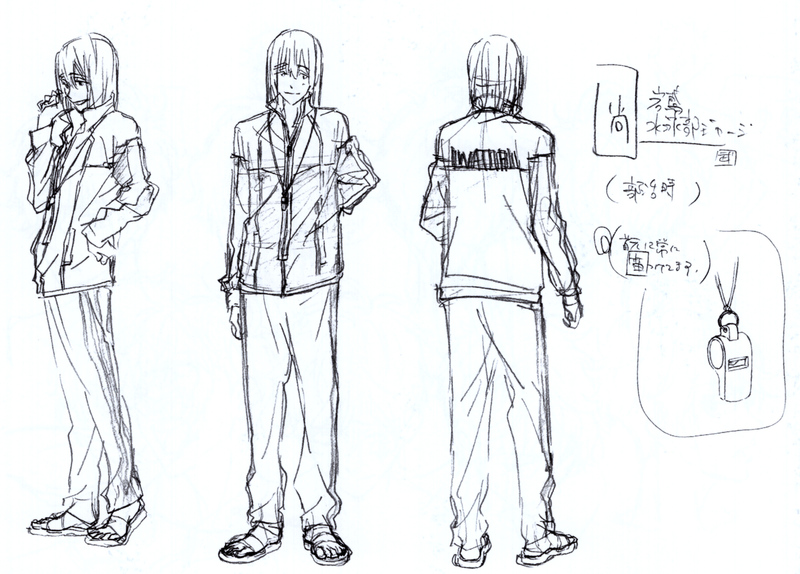 Since Natsuya’s visuals don’t appear in the light novel, I had to design him from scratch for the movie. I’ve already revealed the secret story of Natsuya’s birth at the event* but I was told to completely redo the first draft I had proposed. Thanks to the process of trial and error, Natsuya was eventually reborn as a pleasant and soothing handsome guy. I’m very grateful now that the initial draft got rejected (laughs). *High☆Speed! The Movie stage events held on 31st October 2015 and 1st November 2015 during the fan appreciation event “This Is What We Are Now! !“ organized by Kyoto Animation & Animation Do. ―How did you determine the characters’ height and weight? I used Haruka as the base and decided on things from there on. I picked an average middle schooler height for him, and as Makoto’s body is already quite developed in comparison, I made him 168 cm tall. Since there are many scenes of Haruka and Makoto walking together next to each other, I decided to set the height difference between the two of them right at the start, and then created a balance with the remaining characters. 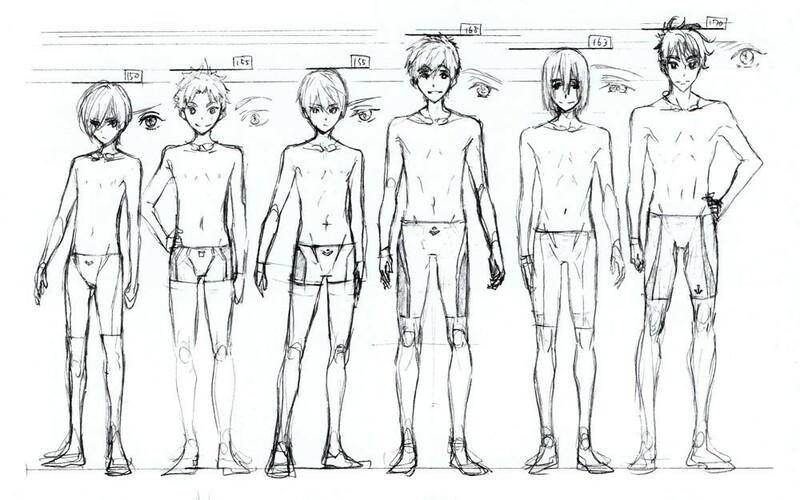 Among the four boys Ikuya is the shortest, and Asahi is about Haruka’s height. Natsuya is a 9th grader, so I had to make him taller than the 7th grader Makoto, and yet he’s already close to his 170 cm… Makoto really is big when you think about it (laughs). As for Nao, I kept his balance with Natsuya in mind and gave him a normal height. Regarding their weight, I didn’t think about it all too deeply. Despite their physical training, they’re still middle schoolers who haven’t had the time to develop their muscles yet, therefore I wanted to drawn them on the skinnier side. They still possess childish traits, so instead of making their muscles stand out I focused on well-proportioned bodies. ―When you dressed the characters in middle school uniforms, was there anything you paid attention to? There isn’t much reference material when it comes to clothes for middle schoolers, so I was troubled. Not only does the childish aspect need to stand out, it’s also important to make the school uniform look baggy on the characters – they shouldn’t look too well dressed. But I was careful not to make them look too unfashionable either. ―I heard that upon entering middle school, you should keep the kids’ upcoming growth spurts in mind and buy a bigger size. I don’t remember it very well but I bought a big size I think…? However, Makoto’s gakuran school uniform already fits him perfectly in grade 7, so by the time he’s a 9th grader, he might not be able to wear his school uniform anymore (laughs). 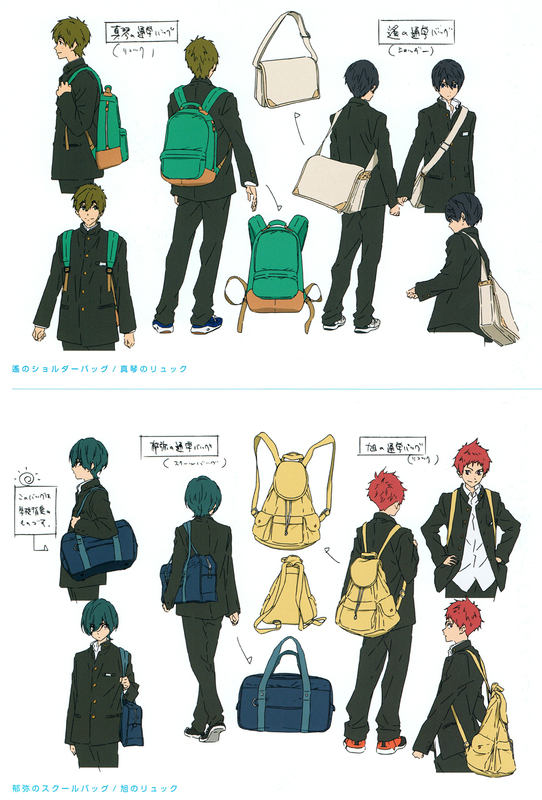 ―It seems like only Ikuya uses the school-mandated bag, is there any reason why this is the case? I thought a plain and tidy bag would fit Ikuya. I wanted the characters to carry the bag types from the TV series, meaning a messenger bag for Haruka and a backpack for Makoto, so I made sure not to give the new characters bags with flashy designs. Even though the school provides regulation bags, it’s quite the free-spirited school, isn’t it? (laughs). ―The characters appear in casual clothes too – how did you come up with their designs? 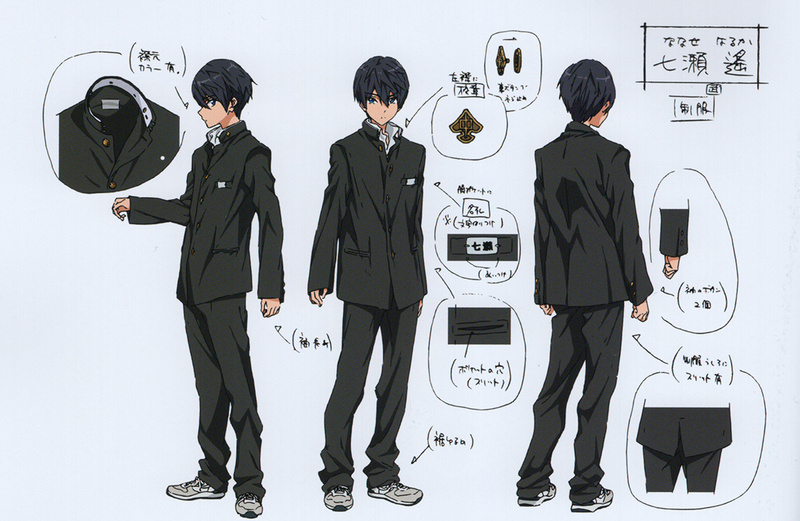 I made it look like Makoto’s clothes in elementary school were chosen by his mother. While preserving this aspect, I also wanted to bring out the feeling that Makoto’s now started picking his own clothes. Haruka wears whatever suitable he finds inside his drawers I imagine, just like in high school. A hoodie sweater feels fitting for him. Asahi already picks his own clothes; he’s conscious about fashion and wants to look cool. 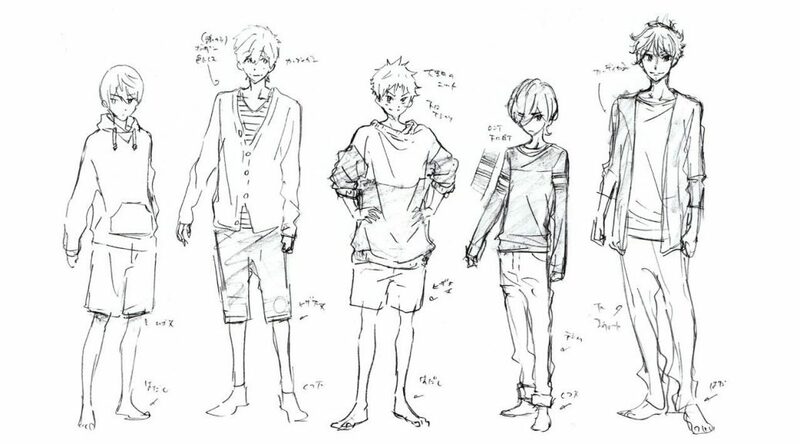 I assume Ikuya picks his own clothes too. I think he would object to the clothes his parents buy for him and tell them “I don’t like those!“ (laughs). 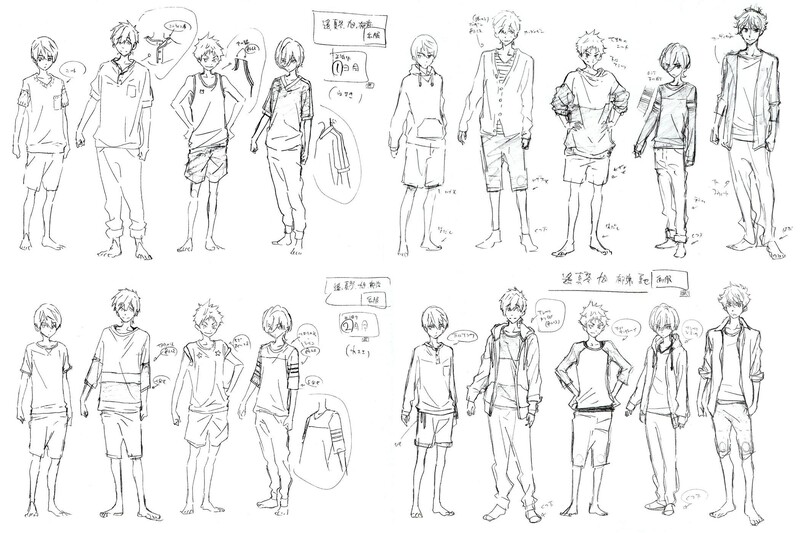 Since they’re middle schoolers, I was alright with the use of shorts as well – I ended up drawing the characters whose image fit them wearing shorts. I also paid attention not to make anyone appear excessively chic. ―Looking back on the time between Free! and High☆Speed! The Movie, what are your thoughts on it? Since I had never drawn male characters to this extent before Free!, I feel like I was too concerned about pursuing male attractiveness. There were many twists and turns until I found the optimal balance. After having drawn them for such a long time now though, my hand naturally remembers the art style. Having drawn Haruka & co. during various growth periods, I feel a strong attachment to these works, from the bottom of my heart. ―You have worked on a lot of works with female characters, how do you feel about drawing male characters? Nowadays, I find it easier to draw guys, so this project was worth it (laughs). As for this work, I simply gave it my all to draw charming boys. I think that over these past three years, I’ve grown able to bring out the boys’ entire charm; not just the appeal of their outer appearances, but also aspects like their idiosyncratic auras and so on. ―What did you and director Takemoto discuss before starting the production? As I‘d already worked on the TV series and was returning to the prop design duty, all details were left up to me. Since it’s a movie this time, I started by creating completely new goggles. I decided on their shape and design by asking character designer Nishiya-san for his opinion, and discussing my proposals together with him. ―Why did you design the goggles anew? Since I‘d already done the prop design for the TV series, I could have just used the same items, but I thought a movie should feature freshly designed goggles. Nishiya-san had a concrete idea for them too, so I drew the designs while using that as the base. 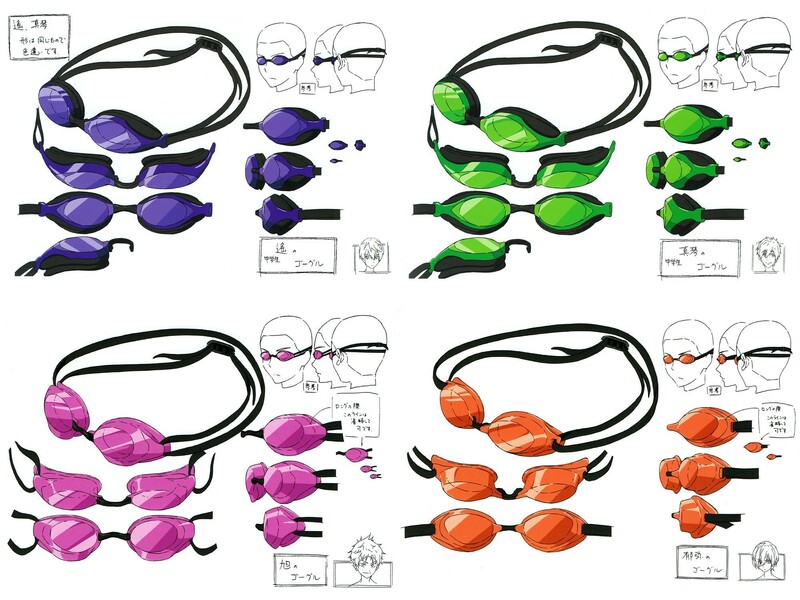 ―Are the goggles Haruka and the others use specifically for middle schoolers, then? It’s not like they are specifically for that age bracket. There are various types of goggles, from the ones aimed at beginners to those for pros who use them during competitions. The ones Haruka and Makoto wear have cushions attached to them, but the kinds competitive swimmers use do not have those, so it seems like they aren‘t suited for long-term use. In fact, I purchased a pair of goggles myself, put them on and sent the photos to Takemoto-san and Nishiya-san to ask them for their input. Goggles have parts consisting of hard material as well as soft material – I think I made this difference obvious both in my drawings and also by offering these stock photos. Actually, it appears like both of them were delighted by them (laughs). Since I wanted to keep everything within the realm of possibility in my role as the prop designer, I went to the nearby gym’s pool for a swim in order to experience the feeling of wearing swim trunks and goggles firsthand. Of course, I provided photos of that too. I was a bit hesitant about the photos of me in swim trunks, but then I thought it should be fine since it’s for the movie (laughs). Looking at the result, it seems like they contributed positively to the movie’s production, so I’m glad I acted independently. ―Give us some specifics – how do you come up with the prop designs? I collect various data and settle on the designs by matching them with each character’s image. When it comes to goggles for example, I prepared a real pair I wanted to use as a model as the base design, then took some notes in the form of a drawing. It wasn‘t an exact copy of the item I use as a model – instead I combined many parts with each other and created a fictional set of goggles. I always keep in mind that the characters’ eyes should come out clearly visible once colors are added and everything‘s finished. Coming up with designs for everyday objects that fit each character is self-evident, but I fantasize about the stories behind them too. For example, since Haruka and Makoto are quite close, the two of them would go shopping for swimming articles together I suppose. Basically, I pick the boys’ personal belongings while imagining what their daily lives would be like. Also, adjusting the prop’s size is an absolutely crucial step. Imagine the size of contact lenses in relation to an anime character’s eyes. The eye sizes in the anime world and in reality are de facto different, which is why I let Nishiya-san adjust the size in animation-related matters. Goggles cover the eye area, so they cannot be too small either (laughs). ―Did you approach things in a different way from the TV series since it’s a movie this time? Although there weren‘t any big changes, I guess the skills we‘ve accumulated until now have come to fruition in important moments. For example, when you stand at the poolside, light gets reflected by the water, right? At those times, the photography staff would do clever things like making the eyes inside the goggles visible. ―Please tell us a memorable incident that happened during the production, if you recall any. Speaking of memorable things, there‘s this design for the milk carton Ikuya drinks out of during lunch break. The milk carton isn‘t an item that appears big on the screen, therefore I omitted some parts where it was possible, and created a simplified design at first… but the director instructed me to draw all of the details. The fact that the director obsesses even about small details on the screen impressed me. When it comes to movies, it certainly is necessary to obsess about the details. In fact, even if the design is elaborate, it’s quite common not to display the item very big on the screen. And yet there‘s no guarantee that there won’t be a close-up of it later down the line. I find it indispensable to increase a movie’s visual density as a whole to begin with. ―Looking back on the time between the TV series and High☆Speed! The Movie, what are your thoughts on it? Personally, I‘d have liked to draw Iwatobi-chan more! It’s a bit of a shame that the part in the end credits roll where Nagisa jumps at it was the only cut it appeared in… As the one who designed it, I would be glad if the beloved Iwatobi-chan could show up somewhere again. From an animation point of view, I thought that swimming was an incredibly difficult subject. Even if you are quite experienced at it, making movements underwater look natural is far from easy. Still, I believe we were able to present it in a cool way by channeling all the staff’s energy into it, and the result was superb. I think High☆Speed! and the Free! series have a broad appeal due to their friendship and youth themes, as well as the genuine passion on display. If I had a best friend like Makoto who cares so much about me, I might have made much more different experiences. So while watching these works, I thought to myself how envious I was of Haruka (laughs). Thanks for this! Is there any hope that Seiichi Akitake will return to animation direction? I’ve been watching older Kyoani’s works and his episodes always seem to stand out for their energy. I think he’s done with the role unfortunately, just like Hikiyama. He’s still doing major work rather than “just” key animation like she does at least. Ah man it’s a pity. I loved Hikiyama’s direction in Hyouka and Akitake is responsible for overlooking some of my favourite cuts of animation from Kyoani shows. I hope we will see more energy focused animation directors from them again one day, although what the current lot pulled off with Liz made me tear up beyond belief.